I am new to the world of Rolex and recently purchased a 16710 GMT Master 2. I would like to remove and preserve the original "Pepsi" insert, as it is in mint condition. I will replace with another used Rolex insert that will take daily wear. I am willing to try myself using one of the many tutorials out there, to include a couple on this forum. However, I would really prefer to use someone who has done this before and can do so without causing damage to the case or bezel. My question is can anyone recommend a professional in the Dallas-Fort Worth area? I already asked two local Rolex dealers who declined. I am also aware the Rolex service center is not supposed to do this, so will not ask. So any recommendations in the DFW metro area? Can't imagine why a watchmaker at an AD would decline. Watchmakers International (Bob and Patrick Ridley) is in the Dallas area. Thanks Larry. I just sent Bob Ridley an email. its extremely easy to do yourself. There are several youtube videos out there showing how to do it. just make sure to tape up the knife or whatever you use to pop the bezel up so you dont scratch the case, and make sure you dont lose the little click spring. This plus i do mine inside a clear plastic bag incase the click spring decides to launch its self. Little trick a watch maker told me. If you do it with some care the spring will never launch, it's not like you're pulling the bezel off with force. This tool is perfect. And there is not a need to place tape on the case to protect the watch. This tool will not scratch your watch! I have the same issue but mine is a GMT 1. Thought it was glue into the bezel,can you elaborate on this. I'm watched a tutorial, and the one that I saw it looks like once the bezel and insert assy are removed, the insert is popped out of the bezel ring by hand. This seems like it could inadvertantly bend the insert ... any alternatives / DIY approach to applying even pressure on the back of the insert ring versus using thumbs? I'm about to secure a 2nd insert (yay!) and will give this a try, I'll probably come up with a DIY approach and share here as I don't like the idea of thumbs, just curious how everyone has dealt with this step? wait ... in #8 2th_doc ... the inserts are off but the bezel is on ... I thought it was first pop the bezel, then the insert. Did I watch the wrong video? Or is this photo just for posterity? thx! This is way easy to do ... I was skeptical and hesitant at first, but it's quite straightforward. Do it!! I took the tip of doing it in a plastic bag, or in my case I wrapped loosely with a few layers of saran wrap to protect the case and lugs. (The picture shows once I opened up the saran wrap, but it was completely enclosed for the next step, below). I put masking tape over a flat bladed screwdriver ! ?, and with the saran wrap being slightly loose, was able to then insert the flat screwdriver over the saran wrap and under the bezel ring and it pops right off. Popping the insert out of the ring and putting a new one in are straightforward. Just make sure to get the alignment right. For me, I aligned the point of the 12 indicator to a 'peak' of the bezel knurls, as opposed to a 'valley'. Make note of the thin stamped washer between the case and bezel ring, and how the spring sits on top of that. The spring is a 'spring' but acts more like a ratchet pawl or like a playing card in bicycle spokes kind of thing. It's like a spring clip, not really a coiled spring. PS - Thanks to the TRF forums for helping me source the extra inserts!! Now, I'm going back to the well to try to find a jubilee band, something about Pepsi+Jubilee just looks right. I like the oyster+LN bezel, but the pepsi / coke seem at home on a Jubilee. That is a picture I took before deciding which insert to put back in the bezel. I always put the bezel on first. Followed by the insert. For me it is easier to align the insert w/ the dial properly. Does the repeated blunt force of a screwdriver or case knife on the bezel make a dent on the case in some way? What do you guys recommend for protection - electrical tape, painters tape, saran wrap?? F the tape & saran wrap. The following is all you need. It will not scratch your watch! 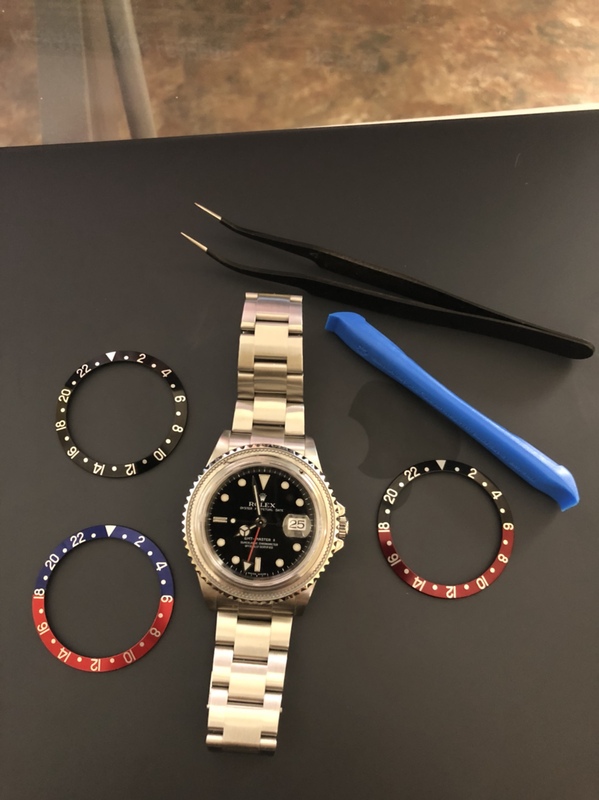 First cannot understand why the need to preserve your insert, a Pepsi insert is just a Pepsi insert, and made to be replaced if damaged.And its quite a easy job to do with care plus the insert only costs around $75 direct from Rolex.